Dr. Haack works as a member of the leadership team for the Tyler Invention Greenhouse. The greenhouse is an open and collaborative “think tank” environment that grew out of the University of Oregon’s Green Product Design Network (GPDN). The GPDN started as a small group of faculty leaders with expertise in green chemistry, product design, architecture, business, and journalism and communication with an interest in inventing sustainable products that can be readily adopted. The goal is to accelerate the movement of ideas from invention to the marketplace in a way that drives innovation. I strive to design consumer products that are safer for human health and the environment. As an educator, I am creating the next generation of thought leaders who are partnering with designers, entrepreneurs and communicators to create holistic solutions that have the highest probability of success in the market. Science makes the invisible visible which leads to good decisions and the design and development of safer alternatives. If we make human health and the environment a priority, we can support the creation of good scientific information that helps our leaders make good decisions and develop safer alternatives. The environment is a complex system at the intersection of life, technology and the earth. Tell your legislators to support science so that we can make good choices about how to guide innovation for the benefit of human health and the environment. 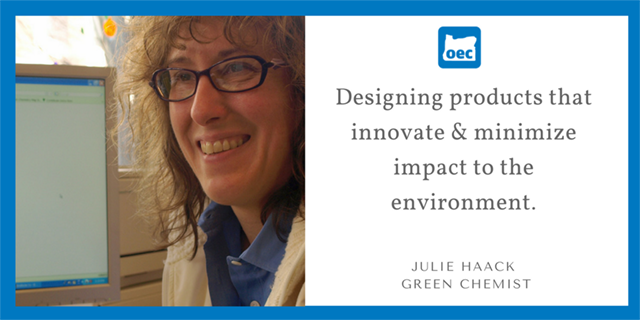 1 Reply to "OEC Celebrates Scientists: Julie Haack, Green Chemistry"